In Part I, we discussed how organizations can take advantage of working with MSPs to proactively save their resources. 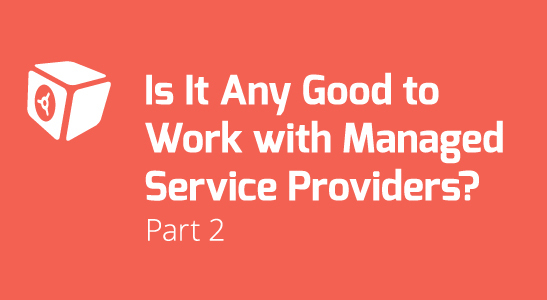 In Part II, we will further discuss other advantages of working with MSPs. IT recruiters can tell you how difficult it is to find the right IT professional for a specific role. It is not because there are no qualified IT professionals, it is usually because the perfect fit is hard to come by. IT environments typically have a mix of applications from small, medium, large and niche providers – matching a resource that has the right knowledge is a long-drawn task. In addition, you need to manage the employees and provide benefits and training, have a backup person who will fill in when they want to take vacation or time off or sick days or leave for another opportunity. Outsourcing comes in handy as it will mitigate all these risks. IT is an important department of almost every company in today’s digital era. However, not every company works in the IT industry itself, which is why their expertise and focus might be reserved for other areas, such as marketing, recruitment, consulting, etc. In other words, not every company has a perfect IT workforce, and thus, organizational gaps exist. An MSP can be instrumental in filling these gaps. An MSP works at the core of IT, which is why not only they can improve the existing IT infrastructure, but also train your employees to develop better data management habits for improved cloud computing, online backup, and data protection, etc. Depending on the scale of your business, writing the code for your entire cloud structure that covers the essential elements viz. cloud backup, secure cloud hosting, admin panel, centralized management system, log and alert system, etc. can take weeks, if not months. Even after the infrastructure is created, there is no telling if any vulnerabilities are left. It will take a considerable amount of time to perfect the system. An MSP, on the other hand, has all the essential tools and scripts for configuring and running a cloud-based infrastructure. Depending on your requirements, the provider can tweak its standard systems and get it up and running in a matter of a few days, allowing you huge time and money savings. In addition, you will enjoy a peace of mind knowing that your IT services are managed by an expert. A lot of companies don’t realize how poorly they are doing in terms of their IT infrastructure until they see the improvement after joining hands with an MSP. It is no surprise managers often express their regret later, believing they should have acted sooner. If you have not worked with an MSP before, you can still give it a shot and observe the impact first-hand. The IT department of any average business has to handle a variety of tasks, including cloud storage, cloud computing, cloud backup, data protection, data mobility in the data management areas, and a plethora of other tasks while ensuring compliance within a set of IT standards. Needless to say, IT department’s workload is tremendous, which is why considerable resources are allocated for its seamless operation. Studies have shown that most companies use only a third of their available IT budget for new projects and initiatives, and the remaining two-third is used up for merely keeping the IT system up and running. However, with a Managed Services Provider (MSP), you can change all this, possibly reverse these numbers. An MSP can reduce your IT costs by managing your company’s entire IT infrastructure remotely for a set, affordable fee. Outsourcing your IT needs to an MSP is not only convenient but also allow you to make the best use of your resources and minimize other associated costs. IT related costs are very often seen as expenses and widely considered unavoidable expenses to keep the company going. This means, there is no room for a “break-fix” type of model, which causes your monthly expenses to go up and down and fluctuate. This, in turn, will cause increased strain in budgeting and planning. To work around this problem, MSPs can sit down with you and come up with options so that you can pay a flat fee and divert your focus on what you do best — your business — and take the guessing out of IT budgets. Your company’s goals become aligned under such flat fee structure — any technical issues will be taken care of by the MSP, not by your local technical resources, reducing your costs. It will be in the best interest of the MSP to act quickly in the case of any issues. If not, both parties lose revenue if the issue is not handled in an effective and timely matter. An MSP monitors your IT systems 24/7, which means problems related to the infrastructure can be detected in early stages, and fixed before any major damage takes place. For instance, data breaches can cause significant loss of important data, but with an MSP you can limit the risk almost completely through its high-level online backup mechanisms. Another benefit of the MSP’s proactive approach is minimum downtime in an event of setting up and running cloud backup and/or cloud computing services and also recovery during a disaster. Businesses must learn to mind their own business. This is the mantra of the new age. Data storage and application support services for your business are strictly not a part of your production activities. Rather, they are the “extras” you need to conduct your business efficiently. The implication is that, you will not lose control over your business activities just because you have chosen to outsource these “extras” to third party vendors. 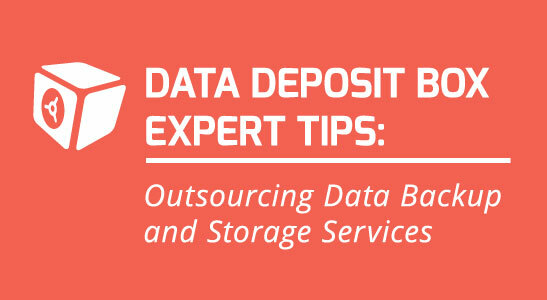 Outsourcing data storage and application support services could help reduce costs. Cloud technology is a utility service and hence an operational expense. Huge investments in capital goods can be amputated from budgets instantly. Salaries for a number of expensive IT personnel can be reduced to the bare minimum. Tape drives, proprietary software can be retired and annual purchases of storage devices can be regarded as expenses of the past. Disaster recovery planning can be automated and business continuity can be ensured at no extra cost. Cloud services are scalable unlike build and own IT infrastructure. Cloud vendors ensure that they have elastic resources at their command and are ready to provide enterprises with additional storage on demand. Customers need only to pay for use and all resources commissioned can be optimally used. Data storage, data replication and high availability of data are automatic. IT Administrators need no longer to worry about failed backups spend sleepless nights ensuring that the data archives and stores are secured against thefts, fires, floods or other kinds of disasters. Data is automatically sent off-site and/or replicated on-site using a single backup interface. Multiple copies of the enterprise data are, highly available on a global scale, round the clock. Although the data is owned by the customer, data security (physical and electronic) is the legal enforceable responsibility of the cloud vendor. Furthermore, the transition to the cloud allows the IT department to shift focus and devote attention to the business needs of the enterprise. IT upgrades and computing issues can be left to the outsourced vendor, while the IT team engages itself in providing its services to the local needs of the organisation. Flexibility is the unique selling proposition of the cloud. Data can be accessed anywhere, anytime using simple web interfaces. All kinds of devices —Smartphones, laptops, desktops— can connect to a single enterprise online data repository. Mobile workers can obtain essential information with due authentication and authorisation from wherever they are. They can backup their data to the central repository and make it available instantly to and management for mission-critical decisions. In short, the cloud has disrupted thinking and created awareness that IT services need not be built or owned by the enterprise. It can be hired just like any other utility (such as power or communication) service and paid for on a per-use basis. It can help optimise on resources and free the enterprise to do what it does best—its own business. So, why build when your can hire? Why invest huge sums and tie up scarce capital when the same or better quality of services can be obtained by utilising a cloud backup and recovery vendor? Data Deposit Box (DDB) is an award-winning cloud data backup and recovery solution, specifically designed for small, mid-sized to enterprise organisations. DDB is differentiated by its numerous value-added and industry leading features – agentless technology, on-site portable local storage, multiple off-site data centres, and virtual environments support.